No output yet, but after I opened the device manager on my computer, it was able to see the GTX 1080. Then I got output to my external monitor. I'm not sure why that happened. 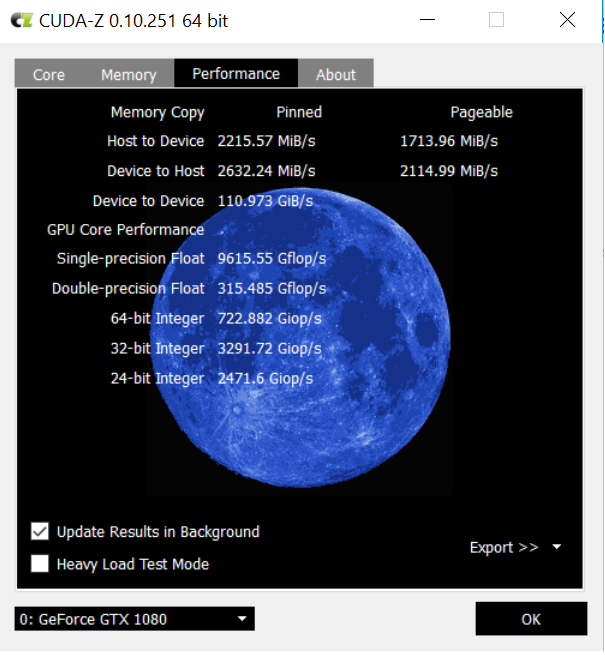 CUDA-Z shows that it's running at full TB3 speeds. I've been testing out Far Cry 5, and I'm able to run it at 1440p on high settings to @ 60fps on my external monitor via the benchmark. On Ultra, I'm getting ~54fps. 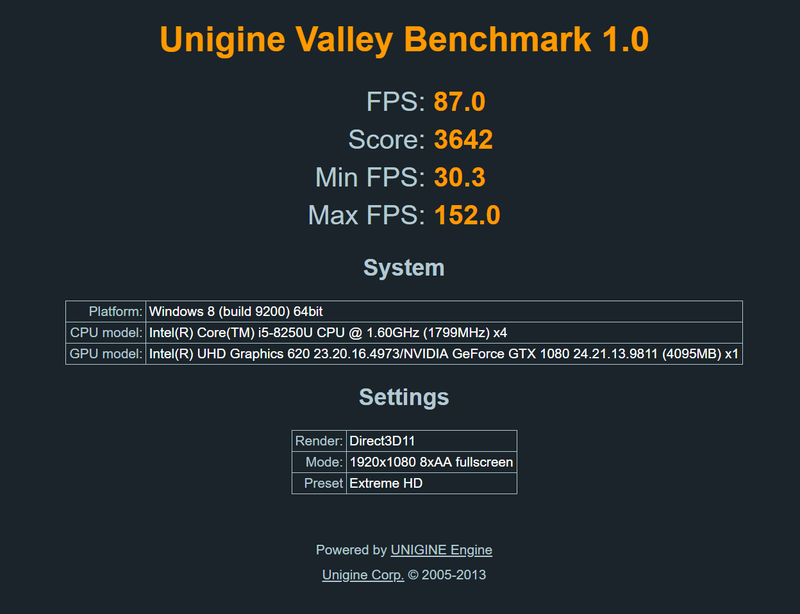 On the internal monitor, I've been able to run it at 1080p on high settings @ 60fps via the benchmark. CPU temps are ~70C, with approximately 70% load, and is running mostly @ 3.2ghz! It occasionally dips to 2.9-3.0, but for the most part it stays between 3.2-3.3! I picked up the GTX 1080 on ebay last week when they had the 20% off coupon for ~450, and my cousin helped me get the node for ~280 (using the coupon). The Yoga 730 in this configuration is normally $849. It's on sale right now @ Best Buy for $749, and if you get the student deal coupon, that's an extra $100 off--for a final price is $649. I was hesitant about getting the Yoga at first because there's a dearth of reviews/benchmarks about its egpu performance, and I was concerned about the way that 15W chips power throttle. Moreover, I've always had 16GB of RAM in every computer that I've bought since 2011, so stepping down to 8GB made me a bit anxious about whether or not I'd end up having a sluggish experience due to swap. I'm happy to say that the experience has been phenomenal. 8GB RAM is working out just fine. The Node Pro was recognized almost right away, drivers installed without a hitch, and I can plug/re-plug/unplug the Node Pro without any problems. ** With the GTX 1080, I'm able to output to my external monitors and game when I want to, and I'm satisfied with the performance. Moreover, while gaming, the laptop/keyboard stays fairly cool, which is important to me. For whatever reason, my fingers are especially sensitive to heat. I'm not a heavy gamer--I am a grad student who needs tablet functionality, and I wanted to display up to 3 4k monitors in addition to my laptop monitor so that I could read and research more effectively. I'm coming from an m3 surface pro 4 + a mid-2014 15" rMBP combo. I feel like this setup replace both of those machines for the most part once I replace the 256GB SSD with a 512GB one (minus my reliance on some OS X apps). The Yoga 730 and its keyboard stay relatively cool, even while gaming. My rMBP would get uncomfortably hot whenever I used it with just a single 4k monitor. Nice work on getting a great budget build! Thank you also for providing the details on 4 PCIe lanes and OPI 4 GT/s in this Yoga 730. The issue with a window opening off-screen is easy to solve. Hover over the program on the taskbar, a "preview" window appears. Right-click it and choose move. Now, don't click anything, just hit one of the arrow buttons on the keyboard. This locks the mouse cursor to moving the window. Now just move the mouse around to get the window on screen. Selecting the program and telling it to go full-screen, or dock to the top/left/right/bottom of the screen also works. This is not eGPU related. It happens when you have several different screen setups that you can dock up to. My machine gets just as confused between different docks and screens/projectors at work, regardless of any eGPU use. @theitsage: thanks! I've lurked for a few weeks while thinking about what to get and found all the information super helpful. I'm glad I could contribute something here. @Yukikaze: Good to know! I was starting to get a little annoyed at having to close/re-open all these windows and their tabs! Thanks. Now after more than 6 weeks, are you happy with the setup's speed, responsivity and stability? What kind of pressure did you expose your 1080-Node Pro to during this time? Also how much noise does it make? The Node Pro with its daisy chain connector is indeed very appealing, however I want to be sure it works like a charm preferably before getting one. Any insights would be appreciated. Thanks for sharing your build! Thank you for sharing, I am strongly considering this exact setup! Can you tell me if the single connection keeps your yoga charged while using it? @Janks, that's an excellent spot of you - indeed the Lenovo Yoga 730, together with the newest Thinkpad Yoga and X1 series, and the Apple MacBook Pro 13", come with chargers in the intervals 61-65W today, so the Akitio Node Pro having 60W is just around the mark where it could suffice but also as a prospective Node Pro user, you want to be really sure too. @Janks did you learn anything more on this topic in the interim? A watt meter like this is useful for getting an idea of a laptop's real world watt consumption also. does it worth it to keep the 3gb 1060? I am a bit unsure, i am offered a Lenovo YOGA 730-13IKB model code 81CT ? Is this exactly the one you are using ? I am confused because the Info on the german Lenovo Page is strange. The part "with the functions of Thunderbolt 3" sounds fishy to me. So could you double check if yours is also 81CT ? It's either 81CT or 81JR (for 13IWL), but both of them has dual Thunderbolt 3 connectors with PCIe 4x and OPI 4GT/s.